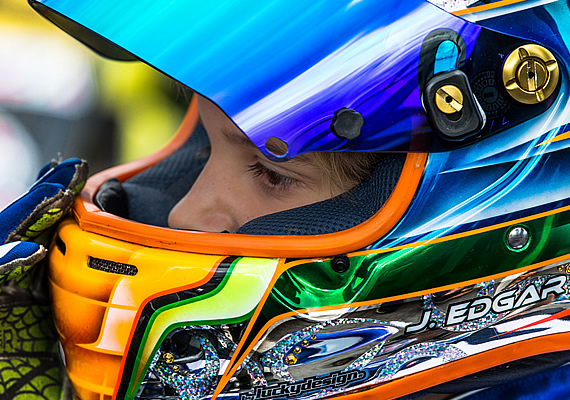 24 hours after his 12th birthday Jonny celebrated with a fine performance at Rowrah. In this St. Valentines Day meeting he gave his rivals a parting kiss and waltzed away to win the Final by a margin of 50 yards or more. Jonny’s win in the Mini-max category followed on from an outstanding victory at PF two weeks earlier and preserved his 100% record in this particular class. On this occasion he was running out of the AMT awning because his normal team Coles Racing had other commitments in Europe. That certainly didn’t seem to be the case throughout Saturday’s practice as Jonny emerged from each session as the quickest driver. However, during Sunday’s opening race, held on a circuit that was only just starting to thaw, Finlay Bunce initially appeared to have the upper hand as he pulled steadily away. It wasn’t until the final stages that Jonny managed to peg him back and then pulled off an audacious overtaking manoeuvre with half a lap remaining. He took a couple of knocks in the next Heat before winning this one with some 20 yards or so to spare. A brief snowfall immediately before Heat 3 had everyone guessing over tyre choices. Like most of the top drivers, Jonny opted for slicks but Matthew Collings chose to go out on wets. It proved to be a wise move by Matthew as he immediately opened up a large gap. With a couple of laps remaining Jonny came through into 2nd place and pulled well clear of Bunce in 3rd spot. However, it was too late to do anything about Collings who coasted to a very comfortable victory. All of the fancied runners were on slicks for the Final. Jonny shot off into a clear lead that he never looked like losing. Just when it looked as though Bunce would finish 2nd, Dominic Bush and Kai Hunter both pulled alongside him coming out of McRae’s Hairpin. There wasn’t room for three karts and Finlay found himself squeezed out of contention with half a lap remaining. Jonny’s next outing at Rowrah will be the ABkC “O” Plate Championships on March 13th when he he’ll be aiming for his 4th consecutive British Open title. It will be followed a week later by the S1 opener at Rowrah. 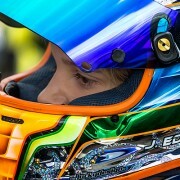 Before then, he expects to compete at PF and possibly Buckmore Park.